This is from an Official Filed Affidavit. Item #12 Mr Wood states that "During October of 2010 and the time proceeding , not one of Ms. Bovat's blogs mentions the NISSAN Leaf - federal money being used to finance the Leaf or the Leafs performance." 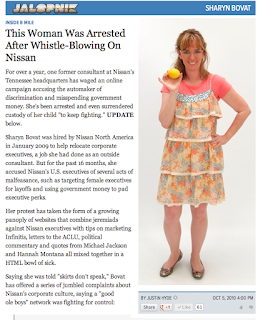 Oct 5, 2010 – This Woman Was Arrested After Whistle-Blowing On Nissan. Please Read! 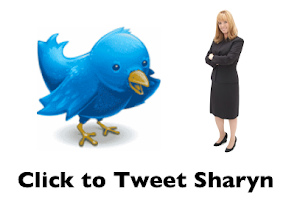 The 2010 Version of the Sharyn has Succeeded. I was told it's the Last Lap..... The ADA made a BIG Mistake. 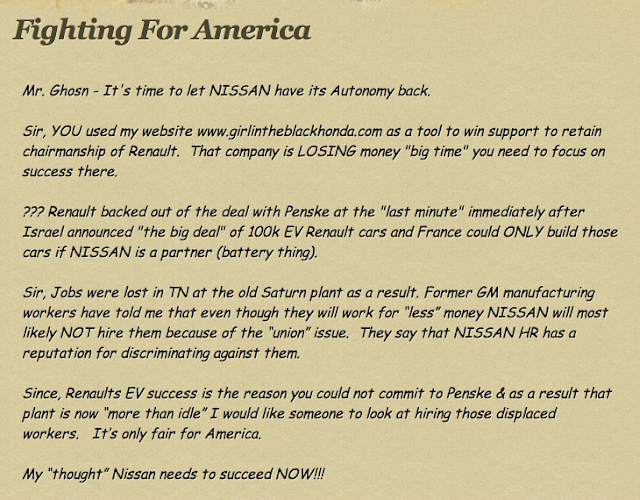 NISSAN is going to try to have the case dismissed on Monday January 14th. with his pants down-people can understand that happened to you was wrong." In reference to the Terry Wood Affidavit. I've been told it LOST it's validity. If a Judge rules it's OK then I've proven HOW corrupt the courts are in Tennessee. This is from an Official Filed Affidavit. 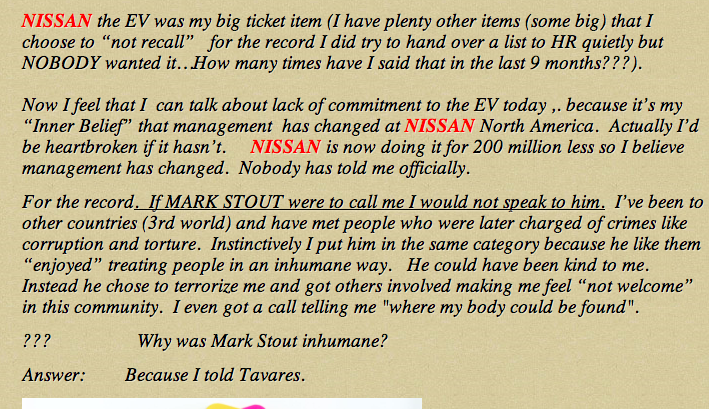 Item #12 Mr Wood states that "During October of 2010 and the time proceeding , not one of Ms. Bovat's blogs mentions the NISSAN Leaf - federal money being used to finance the Leaf or the Leafs performance." I have webstats and copies of my web pages contradicting that. 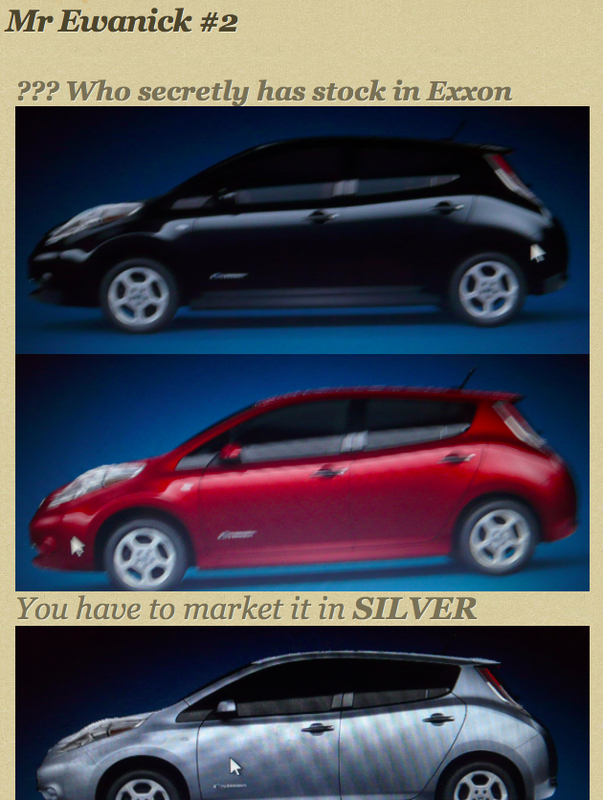 Although the below link to an article from Jalopnik dated October 5th 2010 (will confirm that it had over 40,000 page views that first week in October) it clearly states that I blogged about the NISSAN Leaf electric car PRIOR to October - The Terry Wood Affidavit has numerous other flaws. I would suspect this one is enough to show casuse to move the trial forward. Maybe Terry Wood did not see this posted on my blog? NISSAN had motive to want the charges against me dragged out- I got to talk/meet several lawyers in reference to a federal False Claims lawsuit almost ALL said the "charges" discredited me - Then when the collateral was proven to be an IDB bond backed by the taxpayers I was that since the compensation of the law firms is a % of money retrieved forcing a county to exercise a 2 billion dollar bond to payback the Treasury 1.4 Billion would seem VERY difficult & too expense. To protect the American taxpayers I've been told the best route is asking for a new GAO review based on the Treasury backing the loan. It was relayed to me by UANI (United Against Nuclear Iran) that since NISSAN does business with IRAN that issue is already put into legislation that will be discussed this session. 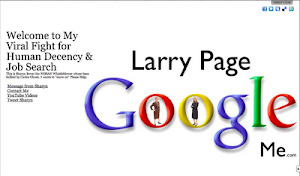 In the summer of 2010 a staffer of Al Gore communicated to me that my blogging about the need for the electric car was appreciated by Mr. Gore. 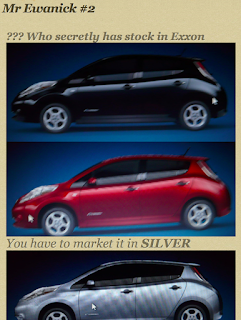 Also, I kept saying the Leaf needed to be "more attractive" and the Fisker was. This will open the door to request a subpoena from the VP. Recently I was told Judge Easter my have a conflict of interest - Most likely on Monday I will simply ask they judge to clarify any NISSAN connections he might have. My only motive is to ensure that I'm treated fairly. Due to the "clear as daylight" Matlock moment in reference to Terry Woods statement that NISSAN Leaf not being mentioned on my blog - or the spending of federal taxpayer money I will make aware to the reporters that have contacted me about their upcoming articles on the NISSAN Leaf this fact alone invalidates the Affidavit of Williamson County Mr. Terry Wood - I feel that it's in my best interest to bring that issue to the attention on the press. 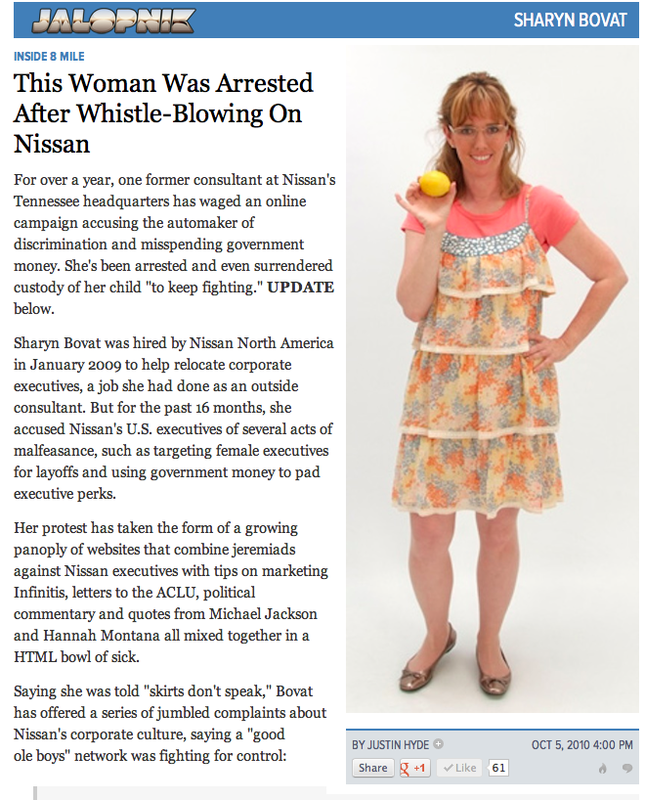 As of yet they have not told my story - I just hope that a formal affidavit finally shows in the written words of a local lawyer in the summer of 2010 said you were "wronged" by NISSAN. My child was 7 when I spoke out about bad spending of taxpayer money & discrimination. She's 11 now. 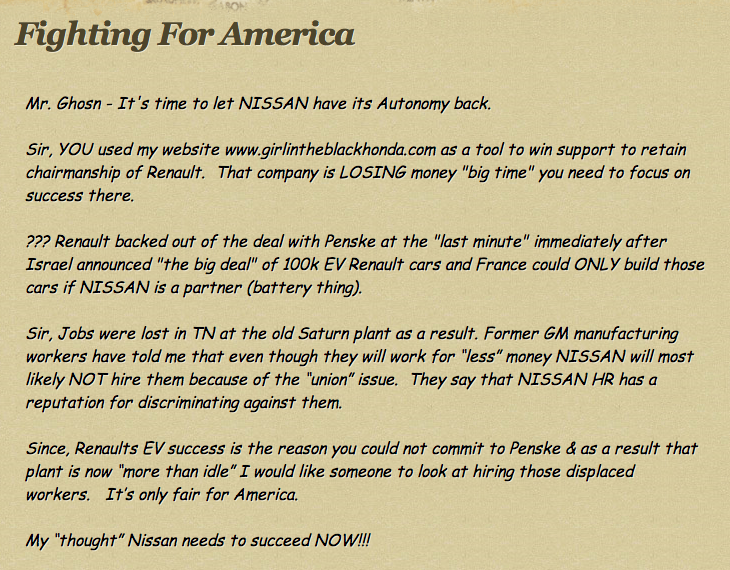 My goal is to get this resolved as quickly as possible it's in the best interest for my child, me and for NISSAN.